Sorry for not having posted in a week. I got caught up in a few things as we prepare for our vacation trip to India after 2 years. Very excited and looking forward to it. Almost a week ago at dinner time, we were at a loss as to what to make, since there weren’t any vegetables handy. All we had was some brussels sprouts and leftover cooked black eyed beans. We decided to make pasta and sauce, and a Mediterranean version of black eyed beans salad with roasted brussels sprouts. The salad turned out excellent taste wise with all the ingredients complementing each other really well. I didn’t realize that black eyed beans in a salad would taste so good. You have to try this. You will love it. The best part is it went really well with the pasta and sauce or on its own. And if you do have any leftover you can just spoon it into scooped tortilla chips and eat, which is what we did after dinner. It was really good and fun to eat too. Quarter the brussels sprouts, drizzle 1 tbsp of olive oil, some coriander and cumin powder, red chili powder, salt and pepper and bake in the oven at 400 degrees until the sprouts are roasted to a light brown color, around 10 minutes. Remove and let them cool a bit. In a large salad bowl, add all the ingredients together and mix well. Serve immediately. As simple as that, and so tasty that you will get a lot of compliments from your guests or significant other. 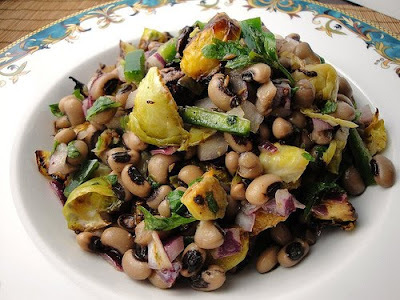 Ingredient Substitute/s: You can add any kind of beans for this salad and the resulting taste will be great – think chick peas, red lentils, kidney beans, lima beans, soy beans. The brussels sprouts can be replaced with roasted green pepper, roasted cabbage, grilled or roasted tomatoes, etc. More importantly have fun while experimenting with this, and let me know how it came out!